Come one, come all! 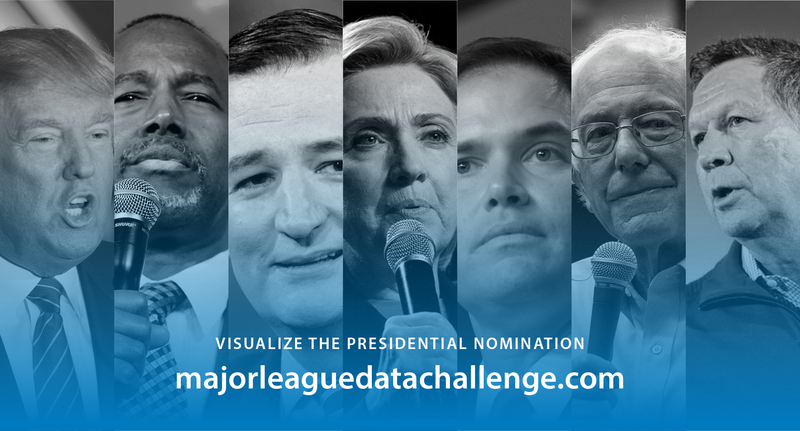 Graphicacy will be announcing the winners of the Major League Data Challenge: Visualize the Presidential Nomination on Wednesday, May 25th at 5pm at the Data Visualization DC Meetup. Make sure to sign up for the event here. Our contestants entered from all over the world, so we are very excited to reveal the winners. The entries showcase many interesting points in what is commonly referred to as the most unique presidential race of all time. As with all of our contests, we hope to help users better understand key topics in areas such as sports, politics, science and current events. We believe our contestants did just that! We hope you will join us for this night of data, design, and drinks. Be sure to bring your analytical and creative thinking caps to discuss the winning entries.